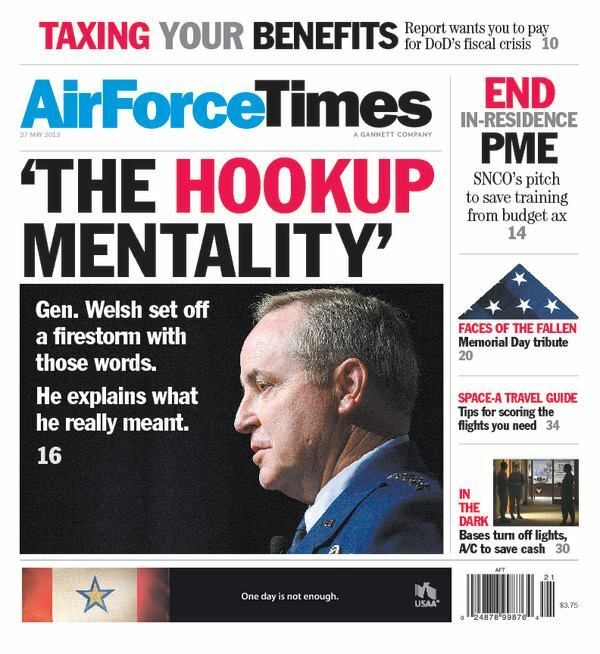 Chief of Staff Gen. Mark Welsh tells Air Force Times that he in no way intended to blame the victims of sexual assault when he mentioned the “hookup mentality” during a recent hearing. In the interview, Welsh explains what he meant and what he regrets about his comments. Since Welsh became chief of staff, the Air Force has launched a pilot program to provide attorneys to sexual assault victims. The program has worked so well that two lawmakers want to expand it to all of the services. The Air Force’s chief legal officer recently took to Twitter to ask airmen and civilians what the military leaders are overlooking when it comes to curbing sexual assault. He posed several questions, including whether alcohol is such a major factor in sexual assaults. Also this week: A senior noncommissioned officer has suggested that one way the Air Force could say money amid budget cuts would be to end in-residence professional military education. Chief Master Sergeant of the Air Force James Cody says whether he thinks that’s a good idea and what the future holds for PME.